Recently I received a couple magazines that are both fairly new, albeit completely new to me. Based out of Italy, Boundaries: International Architectural Magazine is "a quarterly international journal on contemporary architecture, with texts in English and Italian, that offers a critical view over the architectures that today deal, in many different ways, with the challenges of the contemporariness and of sustainability intended as a balance between cultural, environmental, economic and social matters." And then there is the Chicago-based Design Bureau (published by ALARM Press), which "delivers an honest and inspirational global dialogue on design from diverse disciplines and points of view. ...[towards] discovering great design and the people who make it happen." Below are some thoughts on a recent issue of each magazine. 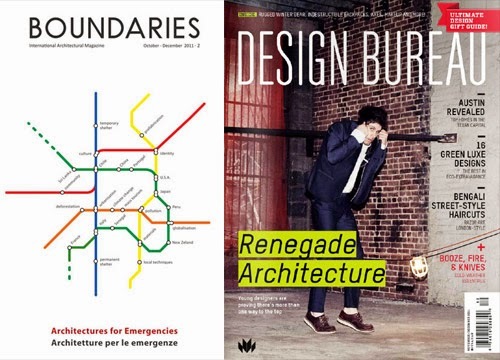 Unlike many architecture publications put out a few or more times a year, Boundaries gives each issue a theme and strictly makes the content fit the topic. The first issue (July-September 2011), for example, is called "Contemporary Architecture in Africa" and does an excellent in job in presenting buildings, projects, books, and histories on the continent. Each issue is structured into sections: News, Perspective, Architecture, Ideas, That Was the Year..., and Book Reviews. The Architecture section makes up the bulk of each issue and highlights particular types of buildings or related strands within the theme. In this regard, issue 2 -- "Architecture for Emergencies" -- collects buildings but also monuments, theories/research, and reporting around the timely and complex theme. That Was the Year is a great part of the magazine, as it features flashbacks usually decades back (a reprinted article or some such piece) that of course fit the issue's theme: Aldo van Eyck's 1959 essay on the Dogon is one found in the first issue, and Jean Prouve's 1956 "House Built in Less Than Seven Hours" is one of the old projects highlighted in the second issue. These first two themes make it clear that Boundaries is not concerned with the same issues as other architecture magazines; the editors prefer to focus on the under-served and the places of crisis today. This is evident not only in the themes but in the projects included in each issue (only the ultra-modern houses in "Contemporary Architecture in Africa" stand out...as designs that would probably be in other magazines but don't really belong in this one) and the position that "Boundaries receives no public funding, and has no advertising." The only "ads" to be found are for the Italian Red Cross and other emergency organizations. This makes me hope the magazine gains enough following to continue its exploration of architecture that is timely and relevant but often overshadowed by the usual big names and commissions that value form over social concerns. Boundaries may not be as photogenic as other magazines, owing to its dealing with the "social awareness of the profession," but it makes up for that small defect (for lack of a better word) in its thorough coverage on a topic, varied viewpoints on the same, and a strong sense of history that makes one realize our problems are not new and neither may be the solutions. Before moving to New York City from Chicago I was a contributing editor to TENbyTEN, a now defunct magazine on art, fashion, design, and architecture. I was sad to see it go some years ago, but when I recently heard about Design Bureau (DB) that frown was turned upside down, as now the Windy City has a magazine on design (in its varied facets) to call its own. (MAS Context is another Chicago publication that I'm glad exists, but it is print-on-demand where DB is available on newsstands.) Issue 08 (November/December 2011) features "Renegade Architecture" on the cover, but that is an anchor to the magazine not a theme, a long piece on architectural designers, those that can't legally call themselves architects but nevertheless shape spaces and cities. The rest of the issue is thick on architecture -- be it Austin, Seattle, New York City, DC, Kentucky, Mexico, California -- but other types of design make it into the magazine's tripartite sections: Informer (brief coverage), Design Thinking (Q&A with a designer), and Features (pretty self explanatory). DB should be commended for a sharp curatorial eye that highlights a wide range of designs and designers. As well their choices of buildings and architects show that they are not concerned with the latest and greatest; it is more about quality and insight rather than the same projects and personalities covered ad nauseum elsewhere. DB should also be praised for the sharp layout of the magazine and the eye towards the illustrations that make up the pages. It seems that even the advertisements, like Wallpaper*, are selected for their attention to graphic detail. Speaking of advertisements, one curious aspect of DB is the way ads for players within an article are found alongside it, such as one for a home builder at the end of a piece on houses in Austin, Texas. Not only is the company mentioned in the article, but they also have ad space on half a page. Did their ad pay for the article? Did their ad drive the content? Or did DB find the right advertiser for the right spot? I'm not sure, but in some cases the relationship between ad and editorial content was a little too close for comfort.